(Toddi Gutner @ Business on Main) If you're like me, you hastily set up a LinkedIn page, accepted invitations to connect, and then left your page to wither. Big mistake. 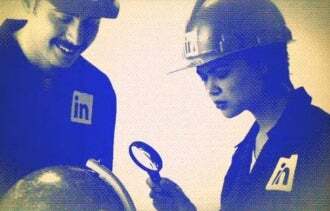 In a recent survey of 835 business owners by Vistage International and The Wall Street Journal, 41 percent of respondents singled out LinkedIn Corp. as "potentially beneficial to their company" -- not just to job seekers. To find out just how employees, employers and small businesses can tap this professional networking site, we turned to Nicole Williams, one of LinkedIn's experts and a small-business owner herself. Williams highlighted several essential tasks for using LinkedIn more robustly to build one's business. "To get the full benefit of LinkedIn, you really have to put yourself out there," Williams says. "Many people underestimate the importance of filling out an entire profile," either as an individual professional or a business owner. That means it's essential to list all past experience that may reflect your ability to execute and problem-solve, even if you think it's irrelevant. While the professional page can be solely about your skills and experience, your company page needs to include a description of your products and services as well. Using both types of pages increases the chance that you or your company will be found in a search. You want to make it as easy as possible for people -- whether they're recruiters, vendors, potential clients or current customers -- to find you, says Williams. Much of your ability to be found through searches will rest in the keywords you use in your profile and company pages. To ensure you're using the right search terms, make sure you include some of the recommended LinkedIn skills that automatically populate when you indicate your professional category. The benefit of using these particular words is that LinkedIn actually changes them based on what's trending in the industry. Finally, ask for recommendations from clients, employers and vendors. "This can help qualify you in [a field where people] don't know you," says Williams. Small companies are usually strapped for resources, and professionals often wear several hats at once. Typically there's only a small team or not even one full person who handles a specific function, whether it be marketing, human resources or business development. To tap into new ideas, identify and implement best industry practices, or just ask a question -- there's no reason why small-business owners and their employees can't use the wisdom of the masses. By sharing ideas, following companies and joining groups on LinkedIn, small businesses can level the playing field and get the kind of information they need to compete. There's a six-episode video series on how to use LinkedIn for small business that covers getting started on building a profile, learning how to build lasting connections with clients, linking profiles to Twitter accounts, leveraging LinkedIn Ads, using the site to reach out to potential investors to grow one's business, and finding corporate partnerships. We have also included a brief tutorial below, with hyperlinks to walk you through the recommended tips. 1. Place your cursor over "Career" at the top of your home page, then click "Companies." 2. Click the "Add a Company" link in the bottom right area of the page. 3. Enter your company's official name and your work email address. If the work email address you provide is an "unconfirmed" email address on your LinkedIn account, a message will be sent to that address. Follow the instructions in the message to confirm your email address and then use the instructions above to add the company page. A red error message may appear if you have problems adding a company page. A preview of your completed company page will not be available. When you publish the page, it will be live on our website. Place your cursor over "Career" at the top of your home page, click "Companies," and search for a company. Then click "Follow Company" in the upper right of the company's overview page. Move your cursor over a company name on someone's personal profile, then click "Follow Company" from the mini company page, if one appears. Scroll down to the "Following" box on a profile and then under "Companies" click the "Follow" link underneath the company name. You can find and join LinkedIn groups from the Groups Directory or the Groups You May Like page. Please note that there may be multiple groups on LinkedIn for each interest, organization or affiliation. Move your cursor over "Network" at the top of your home page, and select "Groups" from the dropdown menu. Search for a group using the search box at the top. Select groups from the "Groups You May Like" box on the right, or click on "More" for a larger menu of groups to choose from. Browse through list of suggested groups. Click "Join" on the Groups You May Like page or anywhere you see the button. Respond to an invitation from a group member or manager.